Sidney Preston Dones was born in Marshall, Texas in 1888. After graduating from Wiley College in 1905 he moved to Los Angeles. In 1906, Dones moved to El Paso, Texas where he unsuccessfully tried to establish an African-American colony in Mexico. Returning to California, he began to prosper by buying and selling real estate. He was also a money lender, an insurance agent, a music dealer, and ultimately, a filmmaker and actor. His primary clientele was African American, but he was also able to win the confidence and respect of whites. In 1924 Dones along with other prominent African Americans, including Norman O. Houston, Joe and Charlotta Bass, Hattie S. Baldwin, bought 1,000 acres in Santa Clarita Valley, forty miles north of Los Angeles, to build a vacation resort for African Americans. These investors, who called their proposed community Eureka Villa, envisioned a resort area of cabins located on half-acre lots, free from the prejudices and restrictions of the city. The resort featured a community house, tennis courts, baseball fields, hiking trails and a nine-hole golf course. It was an immediate success with buyers from nearby states, and as far away as Chicago and Cleveland. While Eureka Villa was never exclusively African American, they were the predominant owners of the restaurants, inns and stores in the area. As an actor and director, Dones is known for the films Injustice (1919), Reformation (1920), and The Ten Thousand Dollar Trail (1921). He was married to Lavinia H. Relerford and later to Bessie Williams. 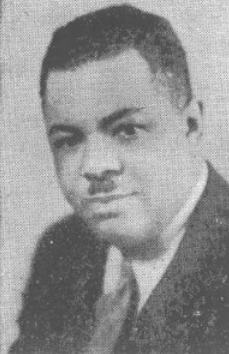 Sidney P. Dones died on August 2, 1947 in Los Angeles, California. Source(s): Bound for Freedom: Black Los Angeles in Jim Crow America; Blackpast.org; IMDB. Photo Source: Pragmatic Obots Unite. This entry was posted in Artist Spotlight and tagged Injustice, Reformation, Sidney P. Dones, The Ten Thousand Dollar Trial by blackcinemaconnection. Bookmark the permalink.